What better time than peak season to carry out an audit of your outdoor amenities. From weather-proofing al fresco entertainment areas, to checking the popularity of new playground features; your guests are the ultimate test pilots. It is your customers who will ultimately decide on the return on investment of your winter improvements; voting with their feet, this year’s – and crucially – next year’s holiday budget. Now is the time to start the appraisal process, You need to spot what look like winners or losers. Modifications may be needed and some may have to wait until the winter months. But it may not be prudent to wait when a stitch in time could reap rich rewards in the form of repeat business and maximising spend. 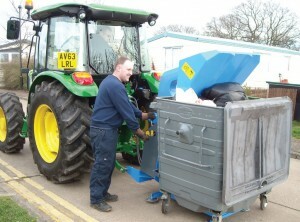 Quick fix amendments could be something as simple as adding more bins or sprucing up your signage, or garden displays. If outdoor spaces are well maintained, they will encourage user-participation by inspiring visitors to be outdoors in the grounds, making full use of the facilities,” points out Christine Virginie, Marketing Manager for Fordingbridge, who are key suppliers when it comes to maximising outdoor space. “This can create great word of mouth and repeat business from visitors having just had a great experience at your park,” Christine continues. “Word of mouth is the most powerful form of marketing and the best aspect is, it’s free! “If your equipment is covered by a canopy, it also increases the life span and therefore reduces maintenance and replacement costs,” adds Christine. Offering customer-friendly outdoor dining is a no-brainer. An inviting al fresco experience with smart furniture and heaters for chilly evenings will increase the number of covers you can serve and ultimately increase your bottom line. One of the key decisions when planning to utilise external areas, is whether the space is for activities, that can generate income or that simply add value to your overall offering. “Presentation of all areas is important, whether a playground, a dining area or a wild flower meadow – they all need to be maintained,” says Simon Williams, Commercial Director at Bridge Leisure Parks. According to Simon there is also a growing trend of people wanting to reconnect with nature and to be active outdoors – and this has been an area of focus for Bridge Leisure Parks. “Our recent outdoor developments include foot golf, archery, dog agility courses, pitch and putt and crazy golf. At Ashbourne Heights in Derbyshire, we’ve recently invested in a foot golf course for one of the fields and developed a nature trail through the woods. Bridge Leisure not only provides active areas on its parks – the operator also promotes ranger activities to take advantage of their parks’ surroundings, providing expert knowledge about the local landscape and wildlife. This is complemented with on-park signage providing more detail about the plants and animals that can be found. 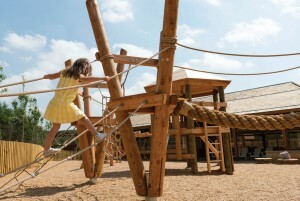 There is no better way of enhancing and enriching an outdoor space than by investing in play equipment. Creating an innovative play space that fi res a child’s imagination and creates a pleasant environment for parents to get together is a winning formula for holiday parks. If you are looking to breathe new life into your play offering then HAGS boasts a huge portfolio and bucket-loads of experience. The company provides a turnkey solution with services including landscaping, fencing, decking and even artificial rock faces. The play specialists manufacture a vast range of products including play equipment for all ages, outdoor gym and fitness equipment, multi-use games areas, skating, ‘parkour’ and furniture. Camber Sands Holiday Park is a typical example. The park owners wanted separate areas for toddlers and juniors and a wide range of equipment. HUGE HIT They enlisted the help of HAGS-SMP to design and install the scheme, which included themed multi-play units, dynamic equipment, a zip line, sunken trampolines and a trail with an 8m traverse wall. The play area has proven to be a huge hit with customers, and according to HAGS, the only complaint from site has been to ask how to keep the adults off the equipment! “Theming seems to be a constant favourite with our clients. From pirate ships to fairytale castles you can add real play value to your areas by engaging a child’s imagination,” comments Simon Wright, Head of Sales at HAGS. Simon advises: “If your budget is tight you might consider planning your scheme in phases, this way you can add to the playground over a period of time that suits.” Specialists in recycled furniture, NBB’s furniture designs are enjoying unprecedented interest this season. “They not only look great and are eco-friendly, but they’ll also will save the park owner money in the long run!” exclaims the company’s Group Marketing Manager David Dean. “In today’s world we all need to be more aware of the materials we use and ensure sustainability is on the agenda. “All of NBB’s recycled furniture products are manufactured in the UK from recycled plastic milk bottles. Purchasing a standard A-frame picnic table, for example, will save over 2,000 milk bottles from entering our waste chain,” adds David. Provide weather protected outdoor spaces. Offer safe and secure bike storage for visitors. Have all weather sports facilities such as MUGAs and covered green gyms. Provide shaded areas for seating and dining. Use walkway canopies to offer weather-protected connections between buildings. Specialist design and built contractors, Fordingbridge is a one-stop shop when it comes to outdoor weather-proofi ng solutions. A typical installation recently took place at the Cotswold Country Park and Beach provides water sport activities on a wide expanse of lake. The owners wanted to create a weather-protected, outdoor dining/spectating space where friends and family of those participating in the water sports could dine and watch in comfort, sheltered from the elements. 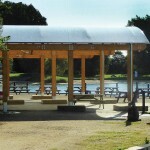 After conducting a free site survey, Fordingbridge proposed a twin-span, barrel-vaulted timber canopy to provide 128m2 of covered space overlooking the lake. The Opal 60 fabric roof covering was designed exclusively for Fordingbridge and is known for its longevity, high tear strength and UV resistance. The install team delivered the project in four days, keeping disruption to a minimum. Great for park operators and the planet, increasingly the holiday sector is choosing recycled plastic furniture over traditional wooden furniture. The reasons are clear. Not only will it never rot, splinter or rust but it is guaranteed against rot for 25 years. There are no long-term maintenance commitment such as painting or sanding down. It’s waterproof and not affected by exposure to chemicals, severe weather or intense sunlight, meaning it can be left outside all year round without any effect on its look and feel – and no unsightly green algae. New for this season from NBB is its London Dining Set – a contemporary table and bench set manufactured in grey plastic, seating up to six guests and saving nearly 4,000 plastic milk bottles from going to landfi ll. Rolec Leisure is seeing a growing number of parks installing charging stations for electric vehicles. Something that park operators are probably encountering more and more are visitors with electric vehicles and plug-in hybrid electric vehicles (EVs and PHEVs). “Demand for EVs and PHEVs is at an all-time high in the UK, with year-on-year sales having increased by more than 27% explains,” explains Martin Georgeson, Sales Director of Rolec Services, the award-winning company is widely recognised as one of Europe’s leading designers, manufacturers and suppliers of EV charging points and accessories. 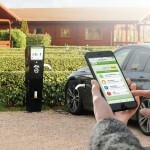 “We are aware of a number of disgruntled visitors to other leisure parks around the country who have aired their disappointment at the lack of EV charging points on EV internet forums, highlighting the fact that demand is out there,” warns Martin. Rolec’s EV charging points are specially designed to be easy and economical to install, safe, and adaptable to a holiday park requirements.